The first time I ever heard about hydrazine, it was from my instructor for 3rd year advanced organic chemistry, Walt Szarek. “If ya ever work with this stuff”, he said, in his Rodney Dangerfield-like accent, “lemme know, so I can leave the buildin’ “. Hydrazine is dangerous. Not only is it toxic, but it is also potentially explosive. As a common component of rocket fuel, it can literally take you to the moon. See, every molecule of hydrazine yearns in its soul to one day shed its hydrogens so that it can become elemental nitrogen, N2, which makes it a powerful reducing agent given the right conditions. What it’s used for: hydrazine, a good reductant and nucleophile, is used in the Wolff-Kishner reaction (a way of converting ketones to alkanes) and in the final step of the Gabriel amine synthesis. The Wolff Kishner reaction is a means of turning a ketone into an alkane. Note what’s happening here: we’re breaking two C-O bonds and replacing them with two C-H bonds. What happens to hydrazine? It’s converted into elemental nitrogen. This reaction requires quite a bit of heat (~200 deg C) and has been supplanted by milder methods. Hydrazine is also used in the second step of the Gabriel synthesis, for liberating the new amine from the phthalyl group. How it works. Let’s just look at the Wolff Kishner here. 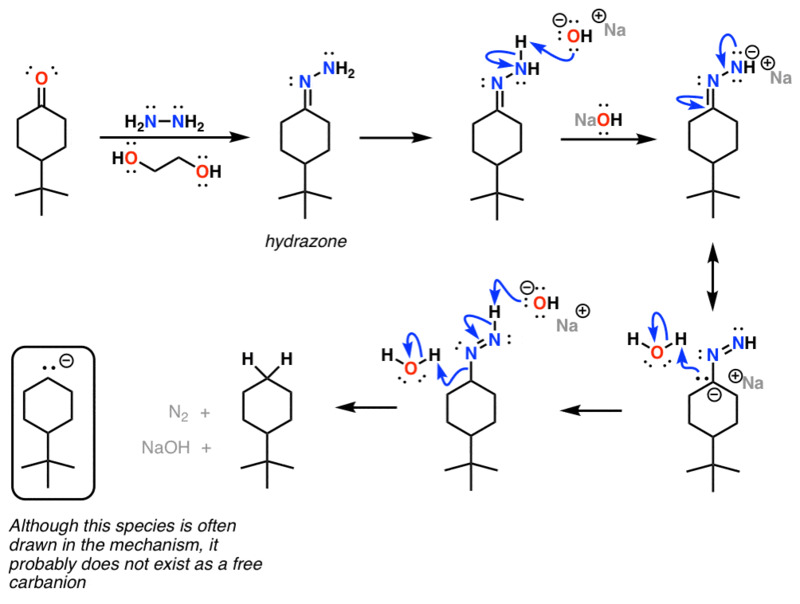 The first step of the Wolff-Kishner is formation of a “hydrazone“, which is what we call an imine with another nitrogen attached. (Here’s a post on how imines form.) In the presence of base, one of the protons on the NH2 group is removed. Once this anion forms, you can hopefully imagine a resonance form where a N=N double bond is formed and the negative charge has been transferred to the carbon. The carbon then is protonated by a molecule of water (it’s also reasonable to use the solvent, ethylene glycol as the acid here). A second round of deprotonation leads to formation of a nitrogen nitrogen triple bond, breakage of the C-N bond (liberating nitrogen!) and then protonation of the carbon with a second molecule of water (or solvent). Result: an alkane. Real life tips: Hydrazine (stabilized as the hydrate) has its uses and is not leave-the-building worthy so long as you know what you’re doing. Avoid contact with high surface area metals (which catalyze its decomposition) , and (it should go without saying) any contact with skin. I don’t know of anyone who’s worked with unstabilized anhydrous hydrazine (any stories out there? ): there’s an example of something you can work with while I go on a “lunch break”. P.S. You can read about the chemistry of hydrazine and more than 80 other reagents in undergraduate organic chemistry in the “Organic Chemistry Reagent Guide”, available here as a downloadable PDF. The Reagents App is also available for iPhone, click on the icon below! I did many reactions with <a href="http://en.wikipedia.org/wiki/Tosylhydrazine"tosylhydrazine (TsNHNH2). Treatment with aqueous sodium acetate gives the intermediate diimde. The diimide was used to reduce an alkene to an alkane in a pericyclic mechanism. Very cool and high yielding reaction. I love that reaction…. hydrogenation, without the metal. Did you find that it took a boatload of TsNHNH2 to get it to work? One of my colleagues did it and that was his experience. I did the rxn on a 4g (9mmol) scale and used 7 eq tosylhydrazine and 10 eq sodium acetate (this was 5 steps into the total synthesis). Rxn complete in 4h, 89% yield. One girl a few hoods down used the reaction as the penultimate step in her total synthesis. On 17 mg of material, she used 400 eq tosylhydrazine and 380 eq sodium acetate over 18 hrs to give 68% yield. Actually, James you do know someone who worked with anhydrous hydrazine and lived to tell about it- AC. He used it to make some solid-supported benzotriazoles. The hydrate didn’t work. It was a total hassle for him to get the anhydrous stuff but it sure worked in his reaction! I did *not* know that! Thanks! When performing an imine synthesis it is important to ensure the pH remains around 4 or 5 and that conditions don’t get too acidic due to Hydrazine’s susceptibility to protonation from strong acids; however, when forming 2,4-Dinitrophenylhydrazone such care for maintaining the pH is not as necessary because 2,4-Dinitrophenylhydrazine is not as susceptible. Why? I’m assuming it is because the unshared pair of electrons of the Hydrazine portion of the compound are not actually unshared but are participating in resonance with the benzene ring via pi bonding (I’m also assuming that the nitro groups being so electron withdrawing is further pulling hydrazine’s electron pairs inward. Is this correct? Does resonance with the benzene ring coupled with the withdrawing effect of the NO2s make it difficult for a strong acid to protonate 2,4-Dinitrophenylhydrazine as opposed to just Hydrazine? A second question is what makes Hydrazine so susceptible to protonation by strong acids to begin with? Is it just the fact it has an unshared pairs of electrons? In the text above you mentioned that it is dying to get rid of its hydrogens; therefore I would expect it would not be too stable with any extra Hydrogens. which is better nucleophile hydrazine or ammonia ? I think it should be ammonia. (2) in hydrazine , one N attracts lone pair of another N , hence lone pair is less easily available, so weaker nucleophile.